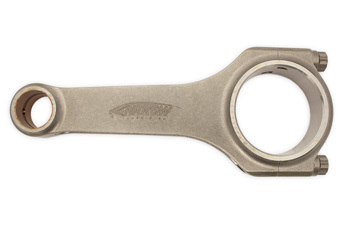 Arrow Precision: manufactures of the world’s best connecting rods. When your reputation is on the line, you only want to choose the best for your customers. For that reason, we use Arrow Precision rods in all of our premium street builds, VAC Race Engines, and have put them though the most grueling racing and high RPM test with no failures. Every Arrow rod is made through absolutely state of the art manufacturing and quality control techniques. Using a premium vacuum de-gassed nickel chrome alloy which has a very low sulfur content (.025%), every step of the rods manufacture takes place under the watchful eyes of Arrows artisan engineers in their UK facility under ISO 9002 standards. They are so finely crafted; they are consistently balanced from end-to-end, and from rod-to-rod within a gram right out of the box... This isn't just on paper, but we have found this to be the standard throughout our relationship with Arrow. Simply, this means the highest quality rod capable of extremely high RPMs and Horsepower, and less work at the machine shop. These rods truly exceed expectation. Arrow's pedigree finds the same Arrow rods you purchase off the shelf are used in World Rally Car (WRC), Le Mans series, Formula 1, Speedway World Championship, British Superbike, Moto GP, Formula 3, F3000, and many more. These rods exceeded even the Atlantic rods in quality.